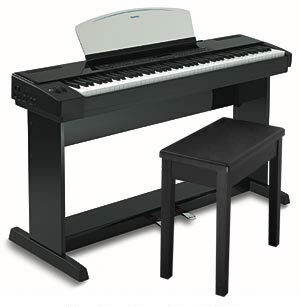 Our new SS (Stage and Studio) Series of digital pianos combines technology, style and affordability for the practicing pianist to stage performer. 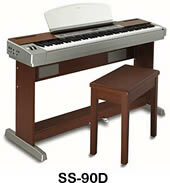 The SS-Series pianos have the features you need. New natural balanced advanced hammer action keyboard, new stereo and 3D instrument samples, built-in stereo sound delivery system and a modern elegance that will impress in any home or studio environment. Expect nothing less from the world leader in musical instrument manufacturing. Suzuki's new balanced advanced hammer action keyboard brings the feel of an acoustic grand piano to the SS-Series. Its new weighted hammer action design offers superb response and smooth feel that will satisfy the most demanding player or music educator. Suzuki's acclaimed imaging sound technology is used to create an acoustic piano sound of remarkable depth, expression and realism. Our stereo sample of a concert acoustic grand piano is the same technology used to create the remaining 127 instrument voices, and any two sounds can be layered together in dual mode. Onboard DSP features such as adjustable chorus and reverb adds sonic depth and realism to the sampled acoustic instrument voices, while the 50 on board songs allow you to play along with the standards. Stereo Audio Input and Output jacks allow for all necessary audio connections. While the MIDI In and Out jacks can connect can connect to your laptop or personal computer or other musical devices. Additionally headphone jacks are provided for private performance.